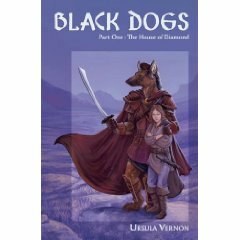 Black Dogs is a story written by Ursula Vernon and is broken up into two or three parts depending on whether you're reading the novels or have read the Elfwood version. The draft on Elfwood was removed a few years back due to some censorship issues, but the story lives on in novel form. Black Dogs starts out with 17-year-old girl name Lyra Volfrieds stumbling into the massacre of her entire house, which was orchestrated by her illegitimate brother. She barely manages to escape into the woods with her life and with her lack of survival skills and street smarts, would likely not escape the forest either. Fortunately for Lyra, an unlikely encounter with the anthropormorphic dog soldier, Sadrao Majid earns her a new friend and a better chance at survival. Unfortunately, however, the assassination of her house turns into small fries in the face of the newer, bigger threat she has to deal with. Along the way the duo meet up with half-elf love interest named Trent, a pair of full-elf lesbian lovers, Jacyl and Sinai and they travel together for a while. Sadrao and Sinai teach Lyra fighting skills and the latter imparts a kind of magical combat knowledge, called the Kytha, upon her before they part ways. Sadrao and Lyra are left to deliver Trent to the House of Diamond to get him magically scanned while Sinai and Jacyl set out to the elf capital to deliver a message. They encounter a couple of Sadrao's old acquaintances, the Funny Animal Spite, an anthropomorphic ermine/ferret and Gunnar, an anthropomorphic giant ground sloth. Trent gets captured and the remainder of the novel follows the rescue attempt. The sequel, which is not yet published, will most likely (barring massive edits to the text in question) have the party captured by a fairly impotent mage, and breaking free without too much difficulty. Later on Lyra gets lost and finds herself in a den of barbaric anthropomorphic hyenas. She is rescued and accompanied by a small black dog. It turns out that this black dog was actually cursed into that form by a wandering magician, and Lyra, falling into his trap, is transformed as well. Trent performs an act of magic to restore both Lyra and the dog (who is a woman going by the name Kuroinu) to humanity, and earns Sadrao's trust. Trent gets recaptured by his father. There is a great war at the foot of Ironspine between the elves and Vade's forces, and Sinai marches into Vade's fortress carried by her Kytha. Lyra is captured by Vade, and in his fortress she finds out that there is more than one face to evil. Also lock-picking in House of Diamonds, but that's not saying very much as the entire reason that Sadrao makes Lyra practice it is because it will be of use later. It turns out to be when she is kidnapped by slavers and escapes via lock-picking. Face Heel Turn ( Trent, towards the end. This page was last edited on 9 April 2014, at 21:14.